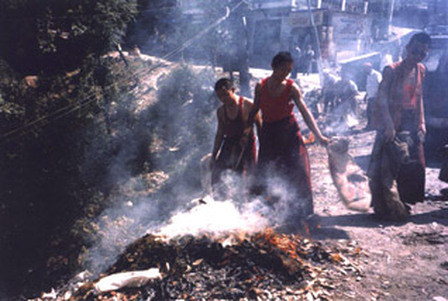 Tibetan monks burn garbage, unaware that they are exposing themselves to toxic smoke. Aligned with the﻿ goals of the project﻿, in cooperation with Tibetan & US-based educators & organizations, we created curriculum, "A Guide to Preventive Environmental Health." This guide has been translated into Tibetan and Hindi and aims to prevent toxic exposure in Tibetan exiled settlements in India. Although we are not currently offering courses, we have and could do so again, upon request. Our curriculum & educational materials have been widely disseminated in Settlements in India. To help Tibetan individuals & families in extreme need situations, we created an Emergency Fund. Recently, we have expanded the scope of this fund to offer aid to orphaned children in Nepal who live with HIV. In the United States, we consider ourselves a Tibet Support Group whose aim is to educate the public about the plight of Tibet. We respect Tibet's powerful example of non-violence and compassion in their struggle for freedom, while facing human rights abuse and cultural genocide. Thank you for taking your precious time to browse our website. We will not only share our past efforts to help Tibetans living in exile; but we will also educate you about the complex challenges of the Tibetan situation inside Tibet & in exile. We hope you will come away feeling inspired to be a part of our efforts and to offer your support for the basic survival and environmental health needs for Tibetans living in exile.